It's a polish used to enhance, protect and beautify natural stone. Keep reading to learn how to polish granite like the pros! Add a protective shield to repel water. Restore slightly worn down stones. 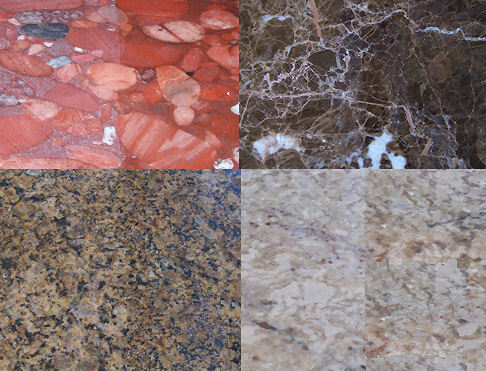 Use it on travertine, granite, marble, limestone, onyx ... all polished stone surfaces. 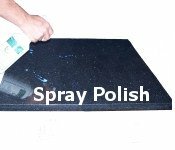 Use it on vertical or horizontal surfaces such as countertops, back splashes, vanities, showers, fireplaces, etc. Do Not use this Stone Polish on your floors. How Often Do I Polish My Granite? Apply it before a dinner party or family gathering. Apply it on a schedule such as every Saturday. Or, visually decide when your stone needs a polish. Spray a little stone polish on your surface. Buff by hand with a clean white cloth or a hand held buffer. First time using the stone polish? Apply a second coat in a day or two. Don't use too much! 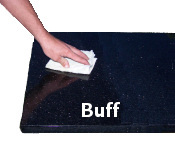 It won't hurt your stone but you will have to buff longer. You never need to strip it, just re apply when needed. How Long Does A Stone Polish Take to Apply? 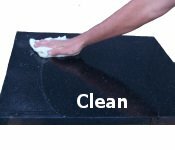 This depends on how much stone you are polishing and where it is (walls, counters, nooks, etc.). Typically, one hundred square feet of countertops will take about 10 - 15 minutes. We tested the stone polish on a dusty piece of Black Galaxy, 2 foot x 2 foot. We wanted to see if the polish added a really noticeable shine and also, if there was a significant difference between hand buffing and using a machine. Cleaned the Black Galaxy with a granite cleaner. Placed a piece of blue painters tape down the center. Sprayed a couple squirts of stone polish on each side of the tape. Hand buffed one side and machine buffed the other. 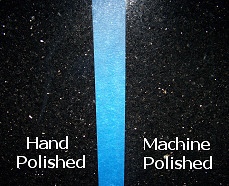 There was a slight difference in shine between hand buffing and machine buffing. The color was deeper and the reflections were a little crisper on the machine buffed side. But, it doesn't warrant recommending that you apply a stone polish with a buffer. Our piece of Black Galaxy sparkled on both sides of the tape! The stone felt as smooth as glass. You can see where we removed the painters tape from the center of the stone. The non polished strip down the center is duller when compared to the surrounding areas. We decided to try it on a few different stones. The polished side is on your right. The stone polish improved the look and feel of all the stones we applied it to. With some stones, the look improved immensely. The stone was shinier and the the color deepened... it looked like you could step into the stone. With others, the change was still noticeable, but not as drastic. All of the stone surfaces felt as smooth as glass. 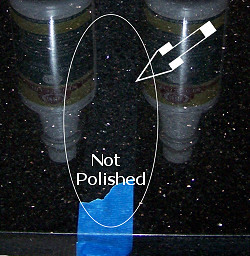 ...it has brightened my granite countertops and adds a nice shine to them. Just wanted to let you know how pleased I am with your product. It puts the product before yours to shame. It has an incredible shine to it and when anything spills on it, it beads up. I used the stone polish on my "plastic" (artificial) granite sink today and it looks better than it ever did! Great on my real granite in the kitchen too, of course.